PICK UP! From our CSR activities. | Yakult Honsha Co., Ltd. PICK UP! From our CSR activities. Yakult Honsha Co., Ltd. publishes “Yakult CSR Report” that summarizes the Yakult Group’s corporate social responsibility (CSR) activities each year. 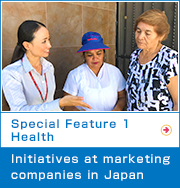 From this report, we will introduce the three special features which Yakult Group regards as highly important.